Tearing ourselves away from New Zealand we looked forward to being welcomed by the family in Australia. We were met at Sydney airport and whisked back to Ourimbah for a roast Sunday dinner, eaten out on the covered patio. The next couple of days were spent catching up with the wider family, doing laundry (displacing the Kookaburra on the washing line! ), swimming in the pool and enjoying a walk along a local beach. My Mothering Sunday present, organised from the UK with the help of Kim, was a much appreciated manicure at a local beauty establishment. Bliss! We then packed again for a couple of days in the Blue Mountains. 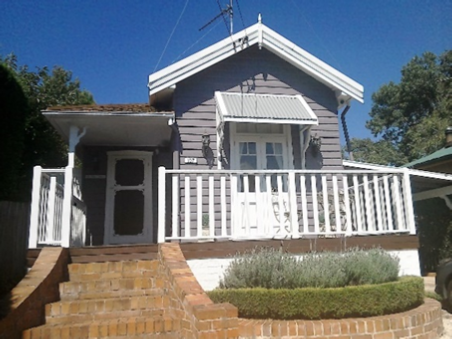 Kim is a wonderful trip organiser and had booked a holiday cottage in Leura for a few days. It was the most delightful little bungalow called La Petite Maison – suitably decorated and surrounded by lavender bushes. Leura is a “garden village” and very quaint. The name is said to be derived from the Aboriginal word for lava, but since no volcanoes have erupted in NSW in the last 10 million years, this seems unlikely. The whole town has a decidedly French feel, said to have been started when soldiers returned from serving in France in WW1. The locals wanted them to have a reminder of the French towns in which they were billeted. The wide main street has cherry trees growing down the centre and the shops have wide covered walkways. Many of the shops have a French feel to them and there are several French restaurants. We were able to have croissants for breakfast. However, we were surrounded by Cockatiels at sunset as they gathered noisily in a nearby tree before flying off to roost. 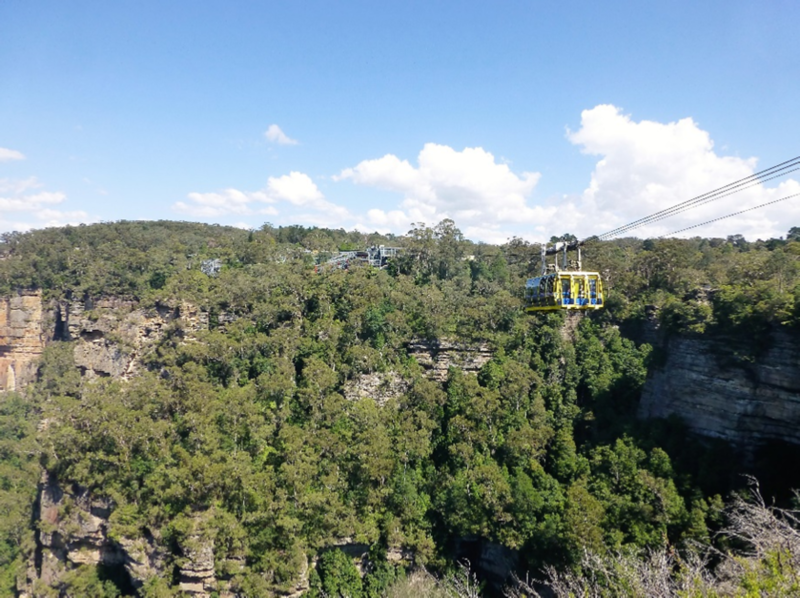 We were staying in the Greater Blue Mountains World Heritage Area and our first port of call was Echo Point lookout, from where there is a great view of the iconic Three Sisters. This is an unusual rock formation, said to be 3 sisters turned to stone, according to Aboriginal legend. Having fallen in love with three brothers from an opposing tribe they were turned to stone by a witch doctor to protect them during the ensuing tribal battle. Unfortunately the witch doctor was killed and the spell irreversible! This is one of several legends. The rock pillars are all over 900 metres high and change in character throughout the day and seasons, depending on the way the sun catches them. Set against the forest covered mountains and gorges they are stunning and contrast with the blue haze caused by the huge number of Eucalyptus trees in the area (hence the name Blue Mountains). When we left Australia Martin and Kim presented us with a beautiful print of the sisters which now adorns our lounge wall. 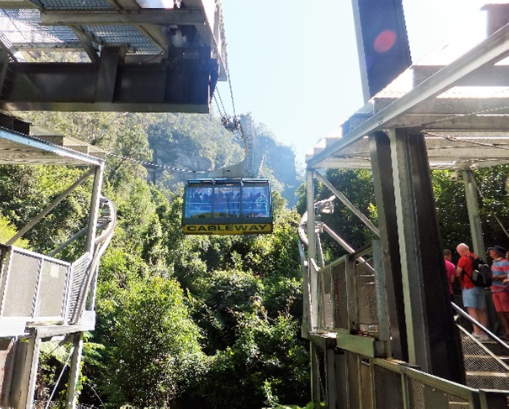 To return we took the cableway that carries 84 people at a time from the Jamison Valley floor back up to the main centre. From there we braved the Scenic Skyway. 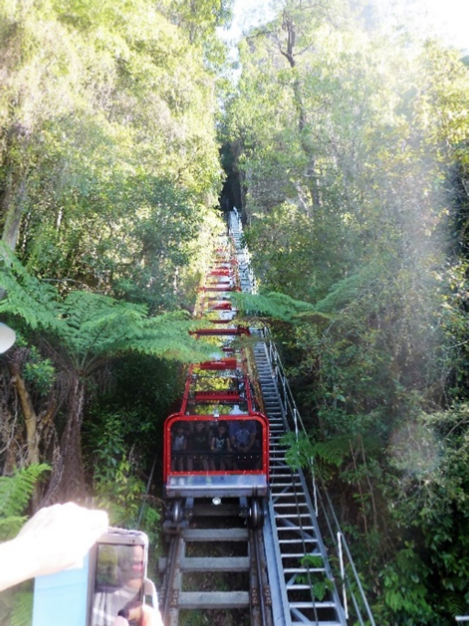 This takes you across the gorge above Katoomba Falls. Halfway across the raised centre section of the floor, made of liquid crystal glass, turns from translucent to transparent so that one can see down 886ft to the valley floor and view the falls. With the steam driven coaltruck clock telling us it was midday we headed west to the Jenolan Caves. 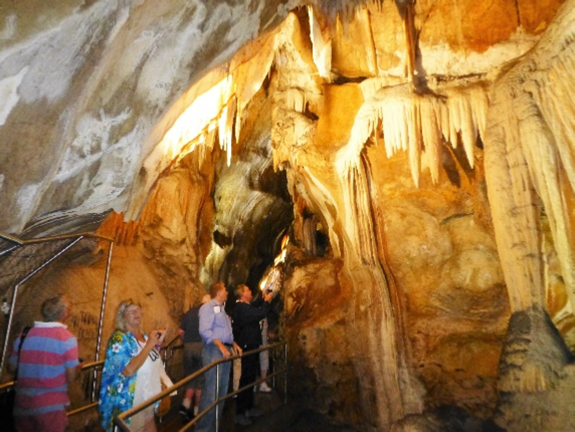 These caves are a huge network following the course of a subterranean section of the Jenolan River. They are probably the oldest known and dated open cave systems in the world and were discovered by Europeans in around 1840. Today there are eleven caves open to the public and we opted to see the Chifley Cave, named in honour of Ben Chifley, a former Prime Minister. It was the first to be lit with electric light in 1880. With 421 stair steps to negotiate and 690 metres of path it was an underground adventure and showed us amazing examples of stalagmites and stalactites, including “straws” and “shawls”. Our guide told us about the features and the discovery of the caves – one chamber is called after the caver’s wife, probably to placate her after all the time he spent underground! There are still miles of cave available for serious cavers to explore. The next morning we packed up and vacated the cottage before revisiting the shops. We had brunch in a café situated in the old newspaper printing office which dates back to 1901, the Wayzgoose. It is named after the annual outing given to the print workers on St. Bartholomew’s day, marking the end of the summer and the start of the season of working by candlelight, something the workers hated. The treat of a day off and a feast was to keep them happy. Wayzgoose probably refers to the sheaf on which they sat and the goose that they ate. 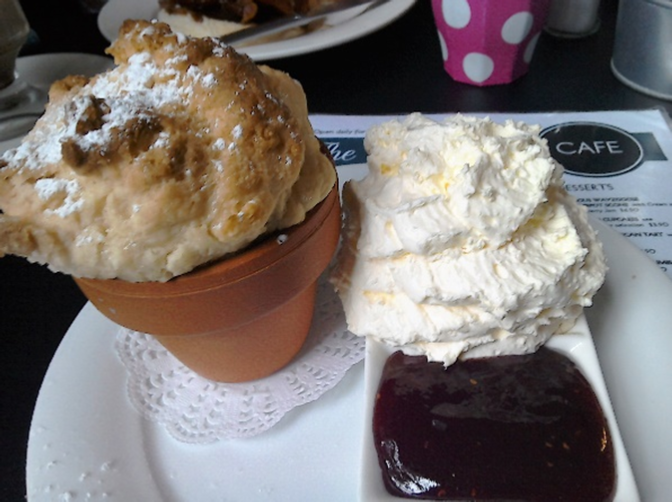 Today the café is renowned for its flower pot scones. Then it was back through the mist over the mountains to the coast again, ready for the next adventure – Sydney. Almost as exciting as the caves was the sighting of kangaroos as we drove back to Leura. Sadly they were so quick to cross our path that there is no photographic evidence. In the evening we experienced an amazing thunderstorm and heavy rain so we had to make a dash for Silks Brasserie, the covered walkways along the boardwalk proving to be invaluable. We had a fabulous meal and I braved a watercress soup with a side serving of oysters. Desserts were beautifully presented and it was almost a shame to eat them.